The summer season kicked into high gear this week as Showbox’s Secretly Greatly clinched a slew of awards in what has been the biggest debut ever seen for a Korean film at the box office. The JANG Cheol-soo (Bedevilled, 2010) pic scored the biggest opening day record for a local release with 497,560 admissions on Wednesday (June 5th) before recording the largest admissions total for a single day for a domestic film the following day with 919,035. It was also the fastest film to cross the one million mark for any film, speeding over the milestone in just 36 hours. 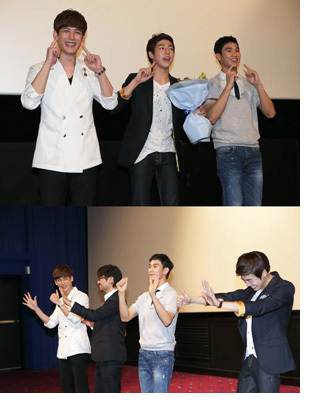 The opening day record for a Korean film was previously held by The Thieves which debuted with 436,596 last July. Secretly Greatly’s 497,560 beat the record by a hefty 14% margin but it’s wasn’t able to take the overall record which is still held by Transformers 3, which opened with 544,995 admissions in the summer of 2011. Showbox’s tentpole saw its fortunes rise magnificently for its second day as it scored 919,035 admissions during yesterday’s Memorial Day holiday (June 6th). This was a big 19% increase on The Thieves previous 770,715 record, which it recorded during its first Saturday last summer. Again, the overall record also belongs to Transformers 3, which brought in a massive 956,500 spectators at the peak of its run. Secretly Greatly also became the first film to cross the one million mark in two days, with Showbox reporting that the film crossed the milestone in just 36 hours, after which it had accrued 1,011,025 admissions. Following a spring slump at the box office for local releases, the film’s success comes as welcome news for the industry. Based on the enormously successful ‘Covertness’ webcomic that was viewed over 40 million times, the film drew in a huge youth crowd, as students wrap up the academic year. What’s more the film brings together three enormous stars in PARK Ki-woong, LEE Hyun-woo but particularly the redhot KIM Soo-hyun.